How are your holiday plans coming along? It's Tuesday of Thanksgiving week and I am still experimenting in the kitchen and finalizing my menu. Yesterday I made the cranberry sauce, which is now happily chilling in the refrigerator. 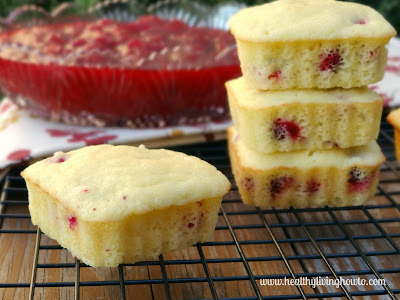 I also made a test batch of healthy Cranberry “Corn Bread” Muffins, which is a spin on my pound cake recipe. Reason being, after making the pound cake a few times and some feedback from a few recipe testers, I came to the conclusion it had a similar crumb and texture to corn bread. A little less sweetener, throw in some cranberries, bake in square muffin tins and voilà low-carb, gluten-free, dairy-free Cranberry Corn Bread Muffins. I am certain these will go perfect with our Thanksgiving feast. Last year I made my friend Peggy's rosemary onion dinner rolls and while everyone enjoyed them, this year I wanted to switch it up. So as the chef, I made an executive decision to go with a slightly tart and slightly sweet corn bread muffin instead of a savory dinner roll. And who knows, I might make a batch without the cranberries as well. One quick note before we get to the recipe…the key to this recipe is the shortening. While butter will work, and the result is still tasty, the shortening is what gives it the crumb we are looking for. Now, when it comes to shortening, please, please, please do not use Crisco. It is hydrogenated (code word for trans fats), which means the fat has been damaged, making it unhealthy for our body. Look for non-hydrogenated shortening, made from palm oil. The brand I use can be purchased at your local natural foods co-op, Whole Foods and I even spotted it at our conventional grocery store in the organic section. Preheat oven to 325 degrees F. With coconut oil, grease the bottom and sides of 10 muffin tins. In medium bowl, sift together almond flour, coconut flour, salt and baking powder. Set aside. In smal bowl, with electric mixer on medium, cream shortening and sweetener until fluffy. About 5 minutes. To shortening add egg and egg yolk, one at a time, mixing well after each. With mixer on low, add half the flour mixture and half the almond milk, mix, then add remaining and mix again. Spoon batter evenly into prepared muffin tins and bake 20-22 minutes. Remove from oven and let cool in pan on wire rack for 5 minutes then remove muffins from pan and continue cooling.